I plan on hibernating (locking myself in the yarn vault and meditating) at least part of this weekend. The Skipper’s family and grand kids are arriving Sunday and after the week I’ve had, well…let’s say I need to get my mind around it. My computer was not able to be fixed. When the technician told me it was kaput I went into shock and then grief as if someone, not something, had died. Because we believe it was a virus that murdered it, I lost everything I had on it. Even the things I backed up I can’t use because I could have also backed up the virus. So much for setting restore points and carefully backing up files. I was not ready to get a new computer, but there I was needing to do just that. While shopping for the new computer I moved through three of the four stages of grief: denial, anger (oh was I mad), and depression. I hate having to learn a new operating system. I hate having lost a number of programs that I depend on to help me with my work and now will have to replace. A pox on those who write malicious codes. I believe I know when the virus (thanks Norton for not doing your job) occurred and so I am going to do things a little differently from now on. The first new thing you will notice is that the Sunday Images will now be shown only on my Pinterest site. You will have to click on the “here” button I will provide each Sunday to see them. This week’s Sunday Image theme is Resort wear for 2016. We’re not even halfway through the summer and the industry is already into next year. Stripes are a big deal again, only this time they aren’t static, they move and don’t always go straight across in a clean line. Texture within stripes is also happening. 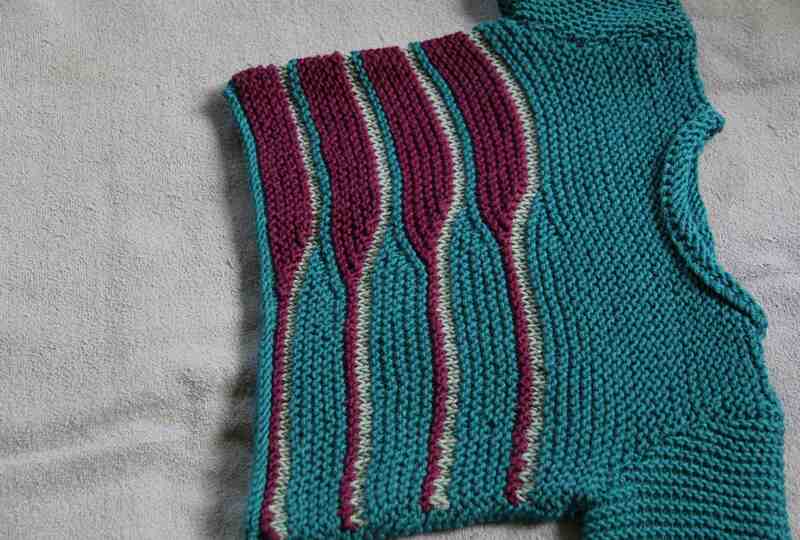 Sequential knitting designs are giving way and becoming stripes in their own right and not necessarily repeated within the garment. Breaking up sequential knitting like this adds texture and interest to a classically shaped garment giving it a fresh look. So I hope y’all will click through to my Pinterest page this Sunday and enjoy the fashion show. Sometimes life gives you a heads up when a rough patch is coming. Little signals warning that perhaps staying in bed with the covers over your head might be a good idea. Such was the case yesterday. I received my warning while sipping my morning tea and watching the birds play in the bird bath in our Serenity Garden. A young bluebird dropped dead in the birdbath. Right then and there I should have gone upstairs, rearranged the yarn vault and made a space for myself, sat down in said space and closed the door. Instead I buried the poor thing and called the local Audubon Society to see if anything unusual was happening with the birds these days. They had not received reports of masses of birds blue or otherwise dying in the area. Not heeding the warning of the powers-that-be that I was the bug and the rest of the world the windshield for a day I turned on my computer to find I didn’t have a computer. I had a black screen, but not a computer. Of course my whole life is on that computer. I started hyperventilating. So I searched and found a plain brown paper bag that I could breathe into just before I passed out. What good is backing up all your info when what goes wrong with the computer prevents you from ever accessing the info or the restore point? These were just some of the thoughts that ran through my head as a breathed in and out, the paper bag soothingly crinkling which each breath. Once my breathing was under control, I got in the car (mistake) and went to the pharmacy to pick up the heartburn medication the doctor prescribed. He seems to think my acid reflux is coming from the hit the esophagus took from the radiation treatments for my breast cancer and the routine stress in my life. Stress? What stress? The pharmacy was open but not working. It had some strange power failure 10 minutes before I arrived and no medications were being dispensed because all their systems were down. I could feel my esophagus release more acid in delight. I went back to the car and began to drive to the place where my computer will hopefully be repaired. No soon had I gotten on the highway then the “check engine” light came on and a strange metal on metal sound came from somewhere under the hood. What I know about cars is when something goes wrong I need someone other than me to fix it. Hence I turned around and the car squealed all the way home. By now my entire esophagus was bathing itself in acid, like a diva in a bubble bath. The Skipper said the car wasn’t terminal. If I didn’t want it to squeal I needed to shut of the air conditioner. It was 87 F / 30.5 C with close to the same dense, suffocating humidity one finds in an Amazon Rain Forest. Driving without air conditioning was not an option. He made an appointment with the mechanic for next week. Today I am getting into that forsaken car again. I will try to get my medicine then I will try to drop off the computer to be fixed. Oh yes, and I will return my now over due books to the library. But before all that, I will call the vet because Yarn Rascal just chewed up an ant bait trap. I hate being the bug. 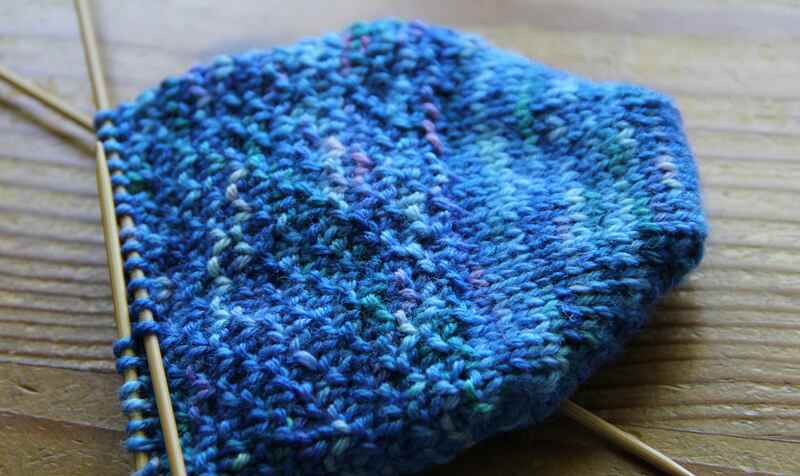 Above is a picture of the unblocked sock I just whipped off the needles. The name of the yarn escapes me—the yarn band eaten long ago by Yarn Rascal—but I do know I got it on sale and that it is machine washable. It annoys me when other bloggers can’t or fail to supply complete yarn information, especially when I think I like the color and want to try the yarn. 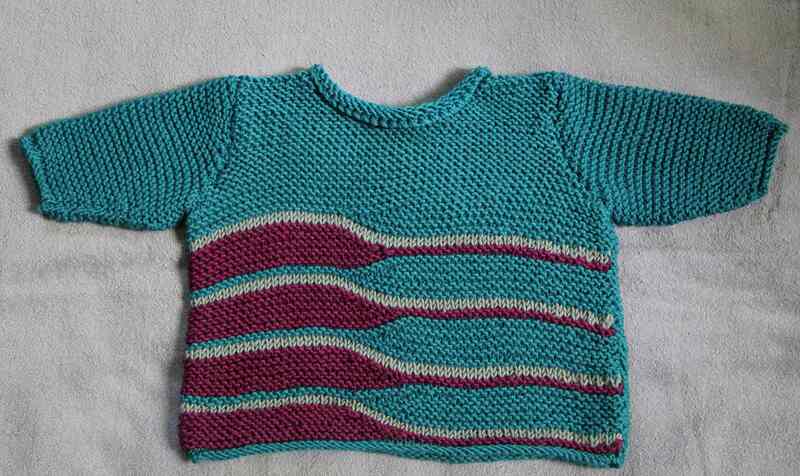 So I am irked beyond reason with myself at not being able to provide full yarn details. This is my life with a yarn loving dog. 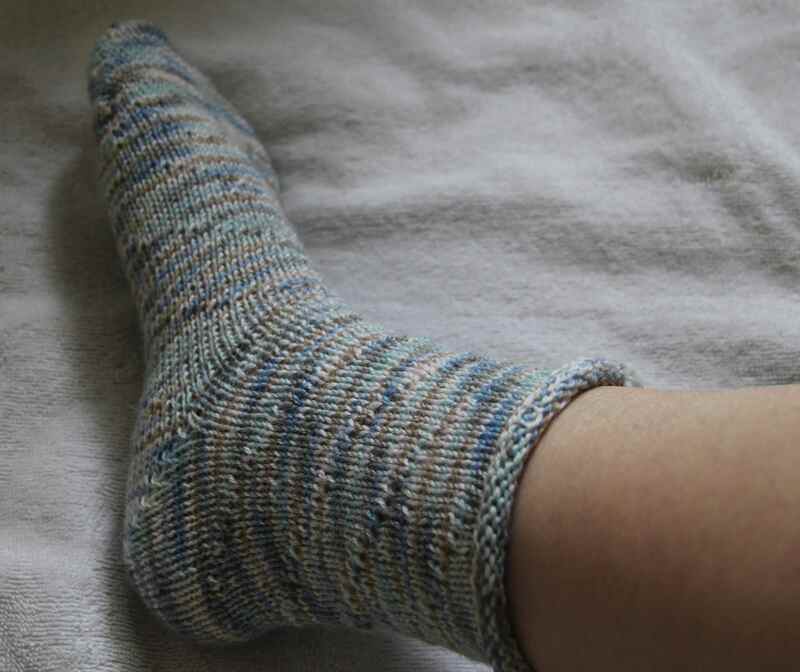 While it is the first sock of a pair, I experienced second sock syndrome the whole time I knit it. Not a good thing, friends, not a good thing. 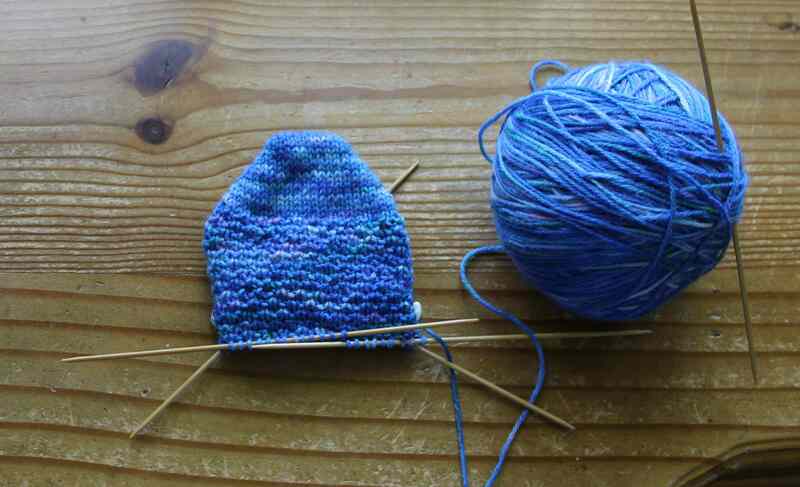 The more I knit the more the sock stayed the same. I spent what felt like an inordinate, totally unreasonable time period knitting the never ending leg. 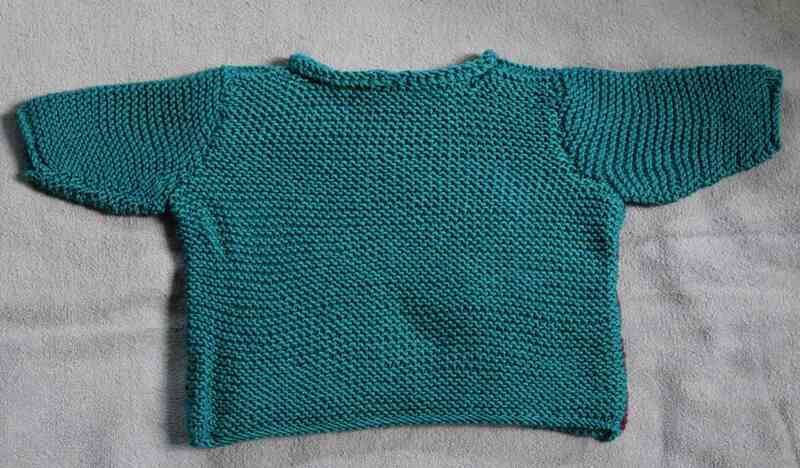 I’d knit for awhile, measure, and surprise, surprise, the length was the same as if I had knitted nothing. The sock became an albatross hung around my neck each knitting evening. The truth is what I really wanted to do was play with the new yarn that arrived. There it sat, pristine, unmolested by Yarn Rascal, whispering “knit me”. So on the third night of knitting the leg (yes, three whole nights for one 7″ (18) cm length leg! I tell you it was torture.) I decided that this was the last night of leg knitting. Whatever the length was at the end of the evening so it would remain. If you have a moment, go back up and look at the picture of the sock again. Notice anything…missing? different? unusual? I bound off the thing without knitting a cuff. That’s right, in my haste to finish I forgot to knit the cuff. If anyone notices I plan to lie and say it is a design feature I’m trying. Tonight I must cast on the companion to the sock above and complete the toe cap while I still remember how I altered the short-rows. Then I will be free to cast on the first sock in the new yarn, which of course won’t be new for long once Yarn Rascal sinks his face into it.